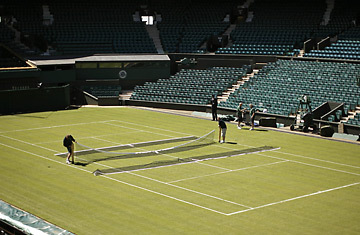 Nets are prepared for play on Centre Court at the Wimbledon tennis championships in London June 22, 2008. In the weeks leading up to the championships  the official name for the tournament popularly known as Wimbledon, to be held this year from June 23 to July 6  guards patrol the grounds of the All-England Lawn Tennis and Croquet Club with German shepherds; their radios buzz periodically with static and their fingers twitch on flashlights. Electrified fences surround the courts in London's leafy southwest. Interlopers of all kinds are unwelcome. Foxes, especially.